In the United States the field of basketry has evolved to include work that stretches the traditional concept of what a basket is. While many people continue to make baskets in both the Native American and immigrant traditions, others are using basketry techniques and materials that challenge the definition of a basket as being a functional vessel… or even being a vessel at all. The National Basketry Organization, which was founded in 1999 and currently has over 600 members throughout the states and overseas, welcomes all basket makers whether their work is a traditional willow basket or a sculpture made of wires and cords. One purpose of the organization is, in fact, to keep all these people connected. It also provides educational opportunities and promotes basketry in general. Communications are central. NBO publishes a quarterly magazine with features on individual artists, techniques and exhibitions as well as how-to articles. It also maintains a vibrant website full of information and links and reaches out to non-members on social media and with its electronic newsletter Over/Under. Every other year NBO hosts a national conference drawing people from all over the country to work with studio level basket makers. 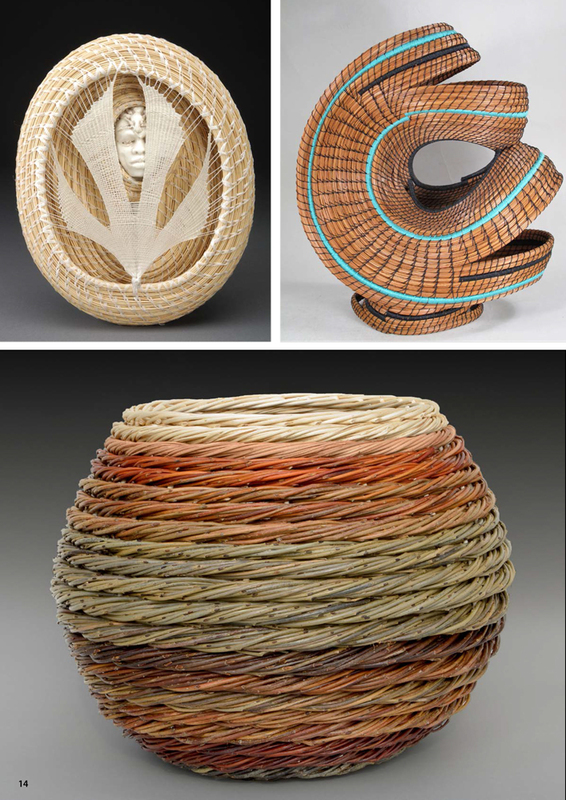 In conjunction with the conference, NBO sponsors a juried exhibition that features the full scope of basketry work being done as well as a non-juried exhibition for those who simply want to share their work with others at the conference. NBO has a history of catalogs that have accompanied these exhibitions and serve as an important archive on American baskets. The organization is currently in the final planning stages of a major traveling exhibition call Rooted, Revived, Reinvented: Basketry in America, which will begin a four-year tour of the country in January 2017. This show will have a companion publication. We invite our European colleagues to follow us on Facebook and to visit our website at http://nationalbasketry.org where they can sign up for our free newsletter. And we would welcome you as members (if enough of you join, we will have to change our name!). Above left: Pamela Zimmerman, Catching the Pale, Pale Moon (Photography by Ronald L. Sowers Photography). Above right: Peggy Wyman, Awakening. Bottom: Katherine Lewis, Sorted out. Find this article in Le Lien Créatif, Spring 2016. Posted	on Monday, March 7th, 2016 at 7 h 31 min	under Associations, Useful addresses.